Media conversion is the most cost-effective solution for extending the productive life of legacy wiring plants and equipment while allowing implementation of technologies. Measuring less than 3.5 inches deep and 2 inches wide, the MiniMc LFPT is one of the industry's smallest media converters with both data connections on the same side of the unit. The MiniMc LFPT extends 10 and 100 Mbps twisted pair network segments up to 80 km over fiber. Both a media and data rate converter, the MiniMc LFPT features 10/100 Auto Negotiation on the copper port while the fiber port operates at 100 Mbps full duplex. 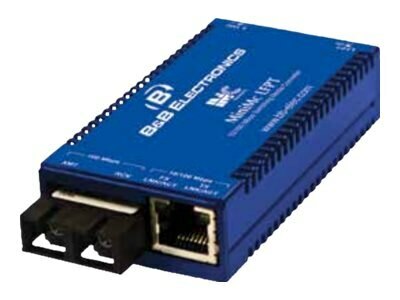 MiniMc LFPT 10/100 switching fiber converters are ideal for all premises, FTTD, LAN-to-LAN or LAN-to-MAN fiber networking applications.